Be prepared. If you know your dog or cat is afraid of fireworks and thunderstorms, ask your veterinarian in advance about products you can use. Tranquilizers, pheromones (in sprays or plug-ins), and thunder shirts are just a few things that may help your pet. Behavioral training is also an option, although it is probably too late to consider for this year. Play with your pet and reassure him/her all day. Long walks are good, and your pet is less likely to be stressed if he is tired from a day of activity. However, be prepared for the stray fireworks that children or adults may illegally set off at any time. Keep pets inside at night with an available place to hide to get away from the noise. Human companionship is ideal, but if you want to enjoy the fireworks at least be sure your pets are able to retreat somewhere inside your home. 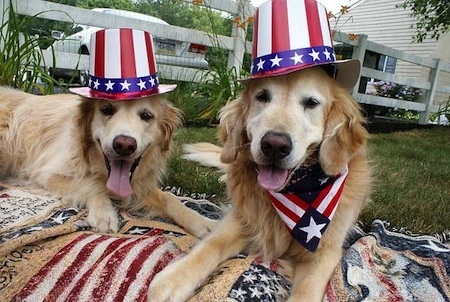 Pets should never be taken to the site of fireworks or left outdoors. There is always an increase in the number of lost pets who bolted out of fear on July 4th, even if they are not prone to escaping normally. Keep windows, blinds, and curtains closed. Even if your pet can’t hear fireworks, visual stimulation is just as frightening to some. Keep the temperature comfortable if the windows are closed so that your pet does not get heatstroke. Distract your pet from the noise. Associate a great new toy and lots of attention with fireworks and maybe he will learn to tolerate them better. Play music or put on the TV to distract from the noise of fireworks. There are even CDs especially for anxious cats and dogs. A little love and advanced thought goes a long way to help your pet through the celebrations. If none of these suggestions works and your pet is terrified, simply comfort him as best you can, go back to number one, and be prepared for next year.